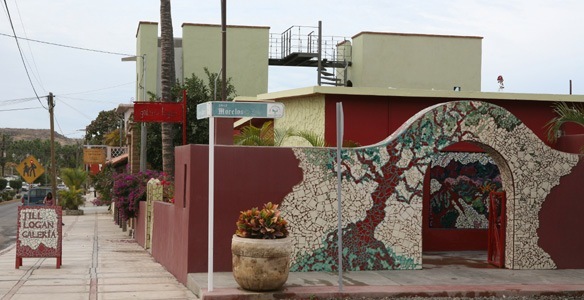 Besides surfing, I knew two things about the Mexican Baja beach town of Todo Santos before I arrived; Hotel California and Artist Galleries. I researched the origin of the words in the Eagles classic and checked out Hotel California on my visit, but I also explored deeper in to Artist world. In fact, each time I walk among the artist space, I find myself intrigued and wondering how they became artists. After an afternoon cocktail at Hotel California (my research), I walked directly across the street and discovered the Jill Logan Galeria. 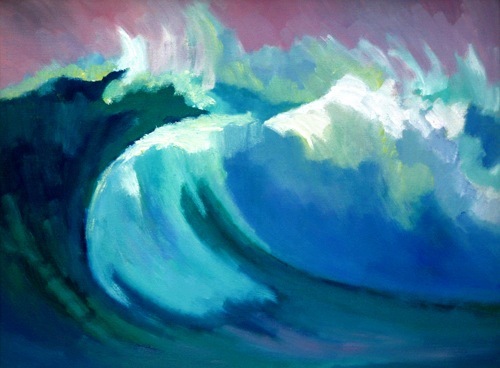 I browsed her work and stumbled upon a powerful painting of a wave. I paused, stared and dreamed. Then, after a few peaceful moments, the gallery attendant broke the silence. We discussed the work and eventually I handed her my card and continued my art walk around Todo Santos. However after an entire day touring the Baja beauty, no paining moved me me like the Ola Grande, the big wave. Weeks later I started receiving emails from the Jill Logan Gallery and I slowly learned about her work and life. She did something people I meet dream or dreamed about. 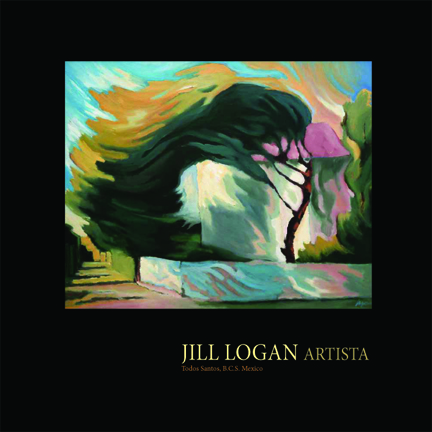 The artist, Jill Logan packed up her life and moved to Mexico to open a studio. Adventurous? Absolutely. Craig Zabransky (CZ): Jill, a pleasure to speak to you. I’ve become a big fan of your work, and especially appreciate your decision to move to Mexico.I appreciate you taking part in my adventurous life series. Jill Logan (JL): Your welcome thanks for interviewing me. CZ: Ok, let’s start at the top, most would consider being an artist adventurous enough but you’ve gone a step further by moving to Mexico to pursue your craft. Do you even consider yourself adventurous? JL: Interesting that I have never considered myself especially brave or adventurous. I do know I have done many things others would never consider doing or even want to, but I trust a certain instinct inside that directs me. And when it says to go for something, I do so with heart and soul. 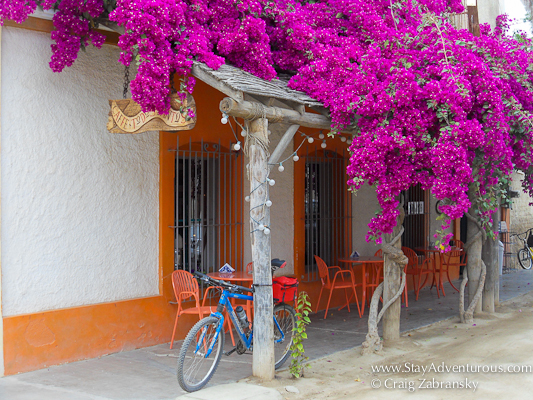 Moving to Todos Santos is one of those events. Every cell in my body said “YES”. I could not ignore it. CZ: Wow, everyone doesn’t always listen to their cells… But I assume they first told you to become a painter. Have you always known you wanted to be a painter? And what age did you start? JL: I painted as a young child when I was gifted paint sets. But as I was one of nine children, the only girl for 16 years, and second oldest. My job was to help my mother raise her young. I spent many hours cleaning, cooking and doing gardening. Interesting that what she did was to instill in me a strong work ethic. I am a doer. CZ: Did you take art classes? Study at University? JL: At age 12 I began taking art classes in my school. This continued through High School. At which point I was certain I wanted to go to the University in Fine Arts, I went to the University of Utah, and then University of California Irvine. CZ: Ok, so you are an artist from the beginning, but what made you decide to move to Mexico? JL: I moved to Todos Santos from Laguna Beach, California, where I had lived for 20 years. In 1992 I visited Todos Santos to have lunch at Cafe Santa Fe. I fell in love with the light quality, the old buildings, doors and the landscapes. Then I asked the owners Paula and Ezio Colombo of the Cafe to help me rent a casita here so I could come on a painting sabbatical. In 1994 I came for 3 months. The first few weeks were difficult, but after 6 weeks I never wanted to leave. CZ: But you did leave, yes? When did you Return? JL: I did leave and it took four more years before I came back for good. During the Art Festival in 1998 I came to buy a small piece of land and the place that is my gallery was for rent. In one hour I made the decision to move here. Six weeks later I was back with everything I owned to set up shop and get legal. It felt right. CZ: Wow, all in one hour and you decided to move to Mexico. That’s following your gut. That’s Adventurous. So today, fourteen years later, what’s been your favorite part or outcome from that adventurous decision? JL: The favorite outcome is that I own my own Gallery and my house. I have no debt. 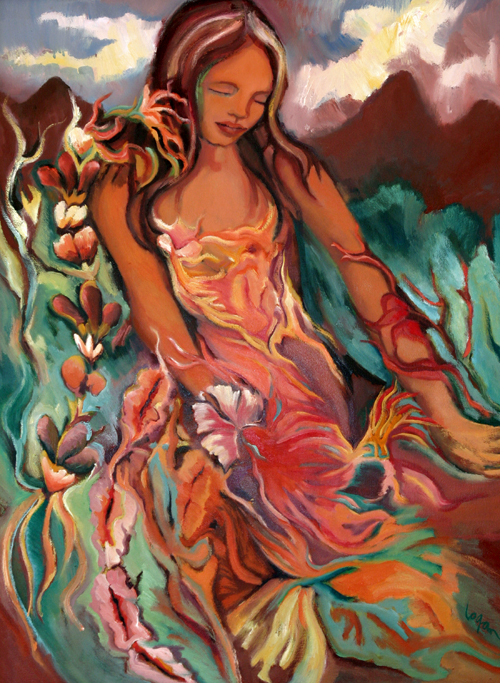 I am able to paint what pleases me and change and grow as an artist at will. I feel very centered and mostly very happy. CZ: Sounds great were there obstacles? JL: It was hard to master Spanish. As I was the contractor on my house, an employee of Mexicans, and owning my own business, speaking clearing and understanding was essential. And at times I felt dumb, unable to understand and unable to speak. I had no languages growing up and very little experience learning Spanish, so most of the time it was a matter of looking the words up that I needed to use and practicing every morning in order to get what I needed done. CZ: I walked in your studio and loved your painting of a wave. What inspires you about your art? JL: My waves where inspired by a time where I had just broken up with a man I was dating and I felt overwhelming emotions. Large waves seemed a perfect visual of how I was feeling. And I like my work when it is free and flowing. Particularly when it seems to me very unusual and original. Many of my pieces have this quality. CZ: Ok, so my passion, travel. 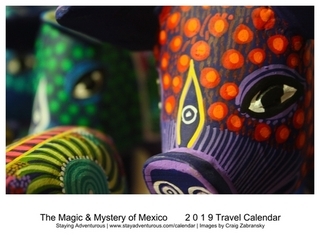 As a travel writer who developed a strong love and appreciation for Mexico I must ask – what place might you recommend as a must see in the area? JL: My favorite beach is Playa Las Palmas or as it now is called “San Pedro”. It is remote, beautiful and magical in every way. I used to close my gallery at 4pm and go there every day to jump into the water. It would always heal me. I also love the old cemeteries. CZ: Ok, in closing and back to the adventurous aspect, what would you tell people who think moving to Mexico and being an artist is a great fantasy, but not possible. Any advice you’d like to share? JL: I believe it is very important to follow your dreams. To have no regrets. To live life to the fullest. If it feels right and you cannot do it any other way, then do it. Don’t put it off. Just go for it heart and soul. You can always change your mind later. CZ: Perfect advice, and thanks for living the adventurous life and sharing it with my audience. Now, if people want to know more about your work, where can they find you. JL: My work is on my website. www.JillLogan.com and and my gallery is next to the Hotel California on the main street in town. You cannot miss it. It is red and yellow, with a wonderful broken tile mosaic of a red tree of life winding over an arch near my entrance. CZ: Great location and some great pieces in the gallery. Thanks again. 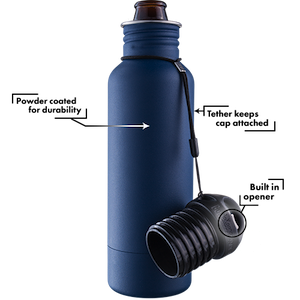 This is part of the new Adventurous Life series and also part of the 2012 Mexican March Madness. Also, all the images of her work, Jill herself, and the gallery have been provided by Jill Logan. An inspiring story indeed.. I absolutely love to read about people who have taken a chance to live the life of their dreams. Thanks for sharing this, Craig. I totally enjoyed the story and how her painting reflects her sense of being centered. I think there are times when all of us would like to walk away from our busy hectic lives and go to a place that looks so beautiful and seems so unencumbered. Then I realize that the adventure I real love is my crazy hectic life. Love your web site! It is my way of relaxing from my hectic day! Deb, thanks for sharing. I tend to most of us think the idyllic or beautiful place would be perfect for the rest of our lives, but I don’t believe it. In fact, I believe we all have a passion, something that drives us and when we find that, when we find our purpose – that’s the adventure we all really love. I love this post, it is so inspiring! I love the seemingly easygoing way of Mexican village life, and I would love nothing more than to do the same thing that Jill did! I love it when people don’t talk about how great it would be if they were ABLE to do something someday, they just do it. Thanks for sharing this. Great photos too! @Payje, Thanks, and I so agree. It’s always great when you talk with people who live the adventurous life… it’s just life to them. i’ve known Jill for 40 some odd years(utah days). haven’t made contact in as many years. please send my love to her and give her my e-mail address.